Every day, Capalino+Company is tracking legislation for our clients, including introductions, amendments and trends in order to provide useful and actionable legislative insight. 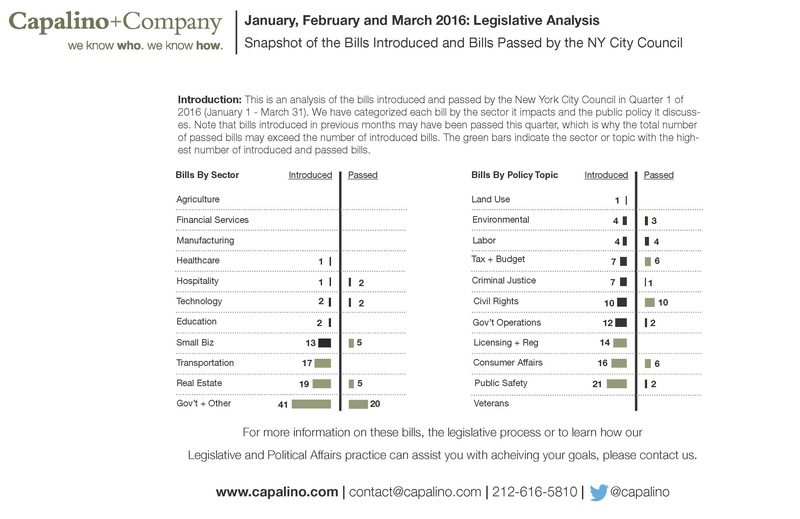 We’re excited to continue the Capalino+Company “Legislative Dashboard,” which summarizes the New York City Council’s legislative activity, including the types of bills introduced and passed by sector and policy topic, and in what quantity. During the first quarter of 2016, the New York City Council has been quite busy. The City’s budget season coincided with a debate on Mayor de Blasio’s major zoning initiatives designed to produce and preserve 200,000 units of affordable housing over the next 10 years. The two zoning proposals- Mandatory Inclusionary Housing (MIH) and Zoning for Quality and Affordability (ZQA)- ultimately passed the New York City Council with amendments on March 22, 2016. Capalino+Company has written extensively on both initiatives. For a summary of the MIH and ZQA proposals and key provisions, read our Land Use Bulletin: Historic Agreement Announced on Affordable Housing Initiatives. The Council completed their Preliminary Budget hearings in which they examined the Mayor’s initial budget proposal for New York City’s spending totaling more than $85 billion. This Budget process will be the most significant legislative activity in the coming months taking us through the second quarter. Keep an eye out for other helpful insights on the workings of New York City’s legislative body. We look forward to sharing our expertise on legislative and public policy issues with you through our weekly newsletter, blog and social networks. For more information on our legislative and political affairs services, or to learn how these bills might affect you, visit our Legislative and Political Affairs Services. Share this with your friends on Twitter or like it Facebook!